^ Janiskee, Brian; Ken Masugi (2007-07-27). “2”. 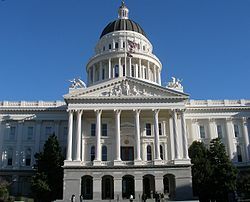 Democracy in California: Politics and Government in the Golden State (2 ed.). Rowman & Littlefield Publishers, Inc. pp. 27. ISBN 0742548368. http://books.google.com/?id=srZnCmkFiEMC&pg=PA27&vq=sprawl. ^ Linda Greenhouse, "Petitioning Upheld at Shopping Malls: High Court Says States May Order Access to Back Free Speech," New York Times, 10 June 1980, A1.